Click on the map above to see more of this interactive graphic at The New Orleans Advocate. Donald Boesch and Virginia Burkett, coastal researchers with Louisiana connections, are widely respected for their expertise on why the state’s coast is rapidly being flooded by the Gulf of Mexico, as well the 50-year, $92 billion effort to stop this disaster. Both believe the success of the Coastal Master Plan could depend on how the world reacts to recently released research. The study doesn’t involve levees, sediment diversions, oil and gas canals or any of the other issues usually debated when Louisiana’s coastal plan is discussed. Keep global temperatures from rising more than 2 degrees Celsius (3.6 degrees Fahrenheit) by 2100 and little will change in Antarctica, which means sea-level rise could be manageable and Louisiana’s coastal plan might succeed. 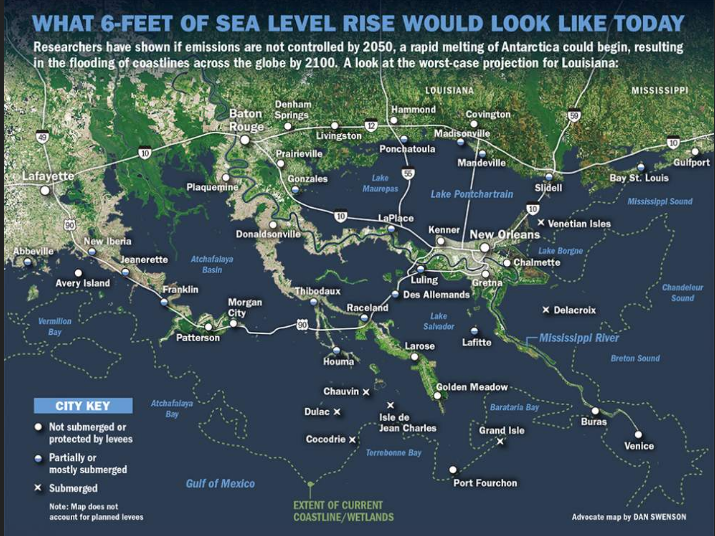 Fail at that goal, and the result could be a sudden, dramatic melting of ice on Antarctica, adding another 3 feet to current predictions of 3.5 feet of sea-level rise by 2100 – an event that would swamp most of Louisiana’s southern third, even with the master plan finished. This year’s international meeting on climate change in Paris set a goal of reducing carbon emissions to a level that would limit global warming to 2 degrees Celsius. Burkett is the former head of the Louisiana Department of Wildlife and Fisheries and now the chief scientist for climate and land use change at the U.S. Geological Survey. She agrees with Boesch. “The rate of ice loss projected for Antarctica could result in the loss of our coastal systems as we know them,” she said. “What happens in Antarctica could determine what happens here. It’s hard to imagine two locations with less in common. The Bayou State is sub-tropical, green and home to pelicans and hurricanes. Antarctica is sub-freezing, white and home to penguins and blizzards. Yet as soon as science confirmed seas are rising because human actions are warming the atmosphere, researchers knew Antarctica would be critical to the futures of coastal communities, especially the already-sinking coast of Louisiana. Atmospheric warming is increasing sea levels two ways. First, water expands as it is warmed, and the oceans have been increasing in volume because of that. Secondly, water stored as ice on land in glaciers and ice shelves is melting and pouring into the oceans, further increasing their volume. And Antarctica holds 90 percent of the world’s ice. Suddenly an isolated, little-visited continent became very, very important. Stretched across the bottom of the planet Antarctica is huge, covering an area roughly the size of the United States and Mexico. Heaped on top of that vast landmass is ice averaging 7,000 feet in depth. Imagine a vast container of water with a faucet at the bottom. If the faucet only drips, it won’t change ocean levels much, scientists have concluded. But if opened wider – then stuck in that position for centuries – most coastlines would drown. Antarctica has been melting at a drip. Indeed, melting on the ice fields of Greenland on the northern end of the planet has been much faster. Located in a warmer environment, its icefields and glaciers have been pouring water into the Arctic Ocean at rates alarming climatologists. Their computer models show sea level would rise almost 20 feet if all the ice in Greenland melted. Evidence has long existed that past episodes of dramatic increases in sea level were accompanied by sudden, huge losses in Antarctic ice. But the new and rapidly evolving science focusing on the complex forces at work on that continent had yet to nail down reliable mechanisms for the progression of ice loss. While the planet has been warming, the size of the floating ice fields surrounding Antarctica have been growing in recent years. These floating fields, composed of relatively recent snows, serve as bumpers protecting the massive land-based ice shelves from the warming ocean. It was one reason the United Nations’ Intergovernmental Panel on Climate Change said Antarctica would contribute little to its “worst case” rise of 3.2 feet by the end of the century. Researchers Robert DeConto and David Pollard had been struggling for years to determine why their computer models could not reproduce the dramatic melting that occurred 125,000 year ago under similar temperatures and carbon levels that existed at that time. Then they learned from fellow scientist Richard Alley that the floating ice fields could break up rapidly if air temperatures continue to rise. When they added that scenario into their models, one result for the future was startling: If carbon emissions are not controlled soon, by 2050 the floating ice fields could fall apart, allowing land-based ice shelves to begin melting quickly. Any rise would be even higher on the Louisiana coast because this area would have an increasingly stronger gravitational pull as Antarctica lost all that ice, Boesch pointed out. “So if a certain amount of ice melts and raises global sea level by 1 centimeter, in Louisiana that rise would be 1.2 or 2.5 centimeters,” he said. Burkett said the new research should be a warning for coastal areas. That’s because when sea levels were 20 to 30 feet higher, carbon levels were only 280 parts per million, and today’s readings have already passed 400. Both agree the report has serious implications for Louisiana’s coastal master plan. Its guiding principle is that the Mississippi River can provide enough sediment to rebuild and strengthen the sinking coastal basins in the face of rising seas and sinking land mass. The Coastal Protection and Restoration Authority, which runs the project, claimed in 2012 that if projects are built on schedule, the state could be gaining more wetlands than it is losing by 2061. Those projections were made using estimates of 10 and 17 inches of sea level rise through 2061 – metrics many scientists said were already too conservative. State officials said the models they’re using in drafting the 2017 update of the plan have tentatively been set at 39 to 70.8 inches of sea level rise through 2100. That already has resulted in the removal of two sediment diversions planned for the lower section of the river in quickly sinking Plaquemines Parish. The higher projection did not alter plans for projects about 30 miles further north. He said computer models showed the Mid-Barataria project at Myrtle Grove could still build enough land to be worth its costs even in the face of 6 feet of combined subsidence and sea level rise through 2061. However, many recent projections show if greenhouse emissions are not dramatically reduced soon, the rate of sea level rise will increase dramatically in the last three decades of the century swamping much of what the state hopes to build by 2061. Boesch said the benefits of reducing carbon emissions should be clear to Louisiana. *Correction: The original story incorrectly gave the distance as 4,100 miles. **Correction: The original story incorrectly said Baton Rouge would be on the coast if seas rose 200 feet. In fact, it would be at least 60 feet underwater, given that the highest elevation now in East Baton Rouge parish is 140 feet above sea level.